We had a great time at the R.O.A.R. Asphalt Nationals held over this past weekend at the Jackson R/C Track in New Jersey. Really nice track, run by really nice people, and a bunch of great locals. It was a lot of fun meeting many old friends that I hadn't seen it quite a long time. 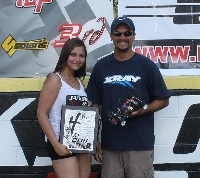 Congratulations to Mike Haynes for taking 2nd overall in 12th scale with his Rev.6. Mike and his 6 were pretty dialed all weekend long culminating with a TQ run in the last round of qualifying. Mike went on to take two 2nds and a 1st in the Triple A-Main format. We would also like to send out a congratulations to Billy Spence. Billy bought a SpeedMerchant X-Ray conversion just a week before the race. Billy doesn't even have a local 12th scale track to run at anymore, so he was trimming his car out at the Nats. Unfortunately, due to the rain, he got very little practice with his new ride. That didn't stop him from qualifying 5th for the A-Main right behind Joel Johnson. Billy went on to finish 4th overall, and had just an incredible battle with Joel in the 3rd A-Main. Billy and Joel ran within 10 feet of each other for about 7 minutes. Awesome racing and tons of fun to watch. Not too bad for just a handful of packs thru his new conversion. Finally, a big thumbs up goes out to Joel "Lady's Man" Vatour. Joel helps out at SpeedMerchant as well as being a very talented up and coming racer in his own right. Joel had never run on asphalt before, and like everyone else, got very little practice due to the weather (and the fact that we didn't get to the race until Friday morning). Joel took his Rev.6 (with his set-up from Friday night carpet racing), threw it down and was dialed. He never turned a screw on the car all weekend, and the only set-up change he made from carpet club racing was tire selection. Joel went on to finish 6th in the A-Main in his 1st asphalt race ever.